When a political novice who has never held an elected office at any level arrives in the swamp as the newly elected president of the United States, there is going to be an adjustment period. 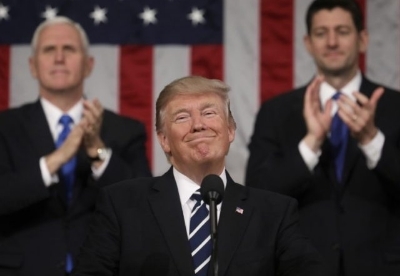 While that adjustment period is certainly not over, the speech Donald Trump delivered to Congress last Tuesday night outlining his vision for a unified nation and his agenda to "make America great" was outstanding. I didn't just fall off a turnip truck. I've watched more than 40 presidential addresses and this one ranks among the best first speeches delivered by a president in decades. Trump's remarks about support for middle American families and workers, especially those trapped on violent urban plantations, his advocacy for supporting law enforcement and our military, and his moving tribute to Ryan Owen's widow — this was very much like Ronald Reagan's first address to Congress 36 years ago. On November 9th last year, I was asked repeatedly by colleagues and friends across the nation if I was ecstatic about Donald Trump's election. My response was, "No, I am relieved." I was and remain, relieved for the prospects of moving our courts back toward constitutional Rule of Law with Trump's promised Supreme Court appointments. Second, as the father of a young Marine, I am relieved that my son and all our Patriots in uniform will again, after eight long years, have a commander in chief who respects them one and all. This tribute to Senior Chief Owens, the first warfighter to be killed under the new CINC, aptly demonstrates that respect. It was a rough night for Democrats, who came into the room expecting a thread of petulant tweets. The best indication of Trump's successful address was the shell-shocked expressions on their faces — they couldn't get out of that room fast enough — especially Pelosi and her white pantsuit caucus. The Wall Street Journal reported Pelosi's charade was a "gimmick, used by Democrats to suggest that Mr. Trump is a threat to our most basic freedoms." The editors added, "Pelosi and her colleagues obviously decided before the event that they would provide television cameras with reaction shots expressing their disapproval or even contempt for the President. He caught them off guard by delivering a big-hearted, moving and gracious address, but they seemed unable to react in real time. The pantsuit caucus and their equally grumpy male Democratic colleagues continued to sit, frown and offer tepid applause or none at all even for lines that would be objectionable to no one outside of ISIS." Kentucky Gov. Steve Beshear, in his Democratic Party response, asserted, "After eight years we left things a lot better than we found them." Seriously, he said that, and then went on to outline what really amounted to all his party's failures in the last eight years. The best The Washington Post could squeeze out fell flat under this headline: "Trump’s speech to Congress highlights influence of Ivanka, Bannon." Really WashPo? That is the best you could do? I have to admit here that for most of my career I have held this left-of-center daily in some esteem, because, despite its editorial page delusions, it still fielded some good journalism. But in the last year, the Post devolved into nothing more than a tabloid shill for Hillary Clinton (you may recall, she was Trump's opponent). WashPo has yet to recover and may never do so.